The report celebrates 10 years of newborn hearing screening in England and calls on the Government, local authorities and health bodies to work together and make a commitment to ensure high quality support is in place as soon as a child is diagnosed as deaf. Action is taken to protect and invest in paediatric audiology services and support them to become accredited under the Improving Quality in Physiological diagnostic Services (IQIPS) programme. The Government and local authorities continue to protect funding for specialist education services for deaf children. Local authorities review the provision of support with communication available to families in their area to ensure that the varying needs of families can be met at any one time. Local authorities ensure that radio aids are more readily available to parents of deaf children so that they can support their child’s spoken language and communication development. The Government should take action to ensure there is sufficient and effective provision across all local authorities for specialist childcare provision for deaf children, and that mainstream staff receive the training and advice they need to effectively include deaf children. This should include action to support parents with transport costs and to improve the listening environments of childcare settings. Full details about the Campaign Report can be found on the NDCS website here. Last year we held a conference together with Sense and Action on Hearing Loss. A big topic of discussion at the event was the political landscape and the Government’s pledge to consider legislation on subtitles for Video on Demand content in 2016 “if it is clear that progress isn’t being made”. This document has now been shared with a range of contacts including broadcasters and the Department for Culture Media and Sport. Now the dust has settled after the general election we know that Ed Vaizey will be retaining his post as Minister of State for Culture and the Digital Economy. It is important that we remind him of his Department’s promise to review legislation in 2016, and urge him to adopt the progress target for broadcaster that we have identified. Action on Hearing Loss has developed a simple campaign action that you can use to email Ed Vaizey about this issue. 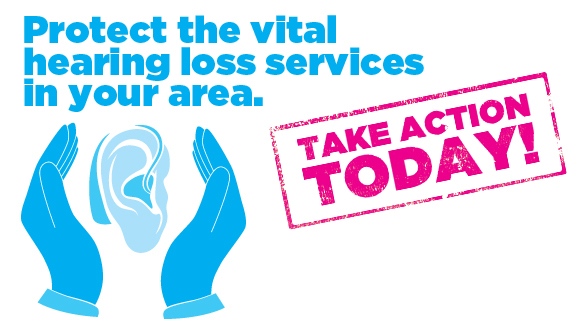 27 JanHelp protect your local hearing loss services – Take Action Today! Based on the findings from a survey of 140 NHS adult audiology providers, the research shows that NHS audiology services across the UK are under significant pressure, with two in every five (41%) offering patients a reduced service as a result of budget cuts or increased demand. It shows that short of removing provision altogether, many providers are being forced to make other changes to their services such as reducing follow up appointments, reducing the number/skill level of staff, increasing waiting times, and/or reducing home visits, and that there is much variation across the UK.